When I ask people what holds them back from working for themselves, the most common response I get is fear of uncertainty. I’m so excited to share the story of Brett Striker, who says the driver of growth in his business has been to embrace uncertainty. Not that he doesn’t have fears, but it’s how he deals with them that is inspiring. He’s the CEO & Founder, Maddy & Maize Popcorn based in Minnesota. They make flavors of popcorn you might have never heard of before like coconut curry, lemon raspberry layer cake and cookies and cream. 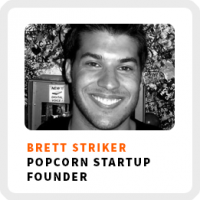 Why he decided to build a startup around a tangible product like popcorn and not something more intangible like an app. Shares where he gets his ideas for his wacky flavors. Even if his business ends of failing, he shares why it’s still a valuable experience for him. Why he didn’t write a business plan and why talking to his potential customers was one of the first actions he took to start his business. Wake up time: About 6:00am with meetings starting around 7:15am. Core work activities + habits: 1) Having conversations with the employees to address their needs and to empower them. 2) Organize his days effectively. 3) Maintain mental health through meditation, working out or walking. Ideal work environment: Sometimes away from the kitchen, by himself in his apartment or at a coffee shop; sometimes at the kitchen, focusing on the product. Regains focus by: The sense of fear that he’s lost motivation. Getting freaked out if he’s not freaked out. 90-day goal: Survive the holiday season having gotten the big orders placed and then taking a step back in January to appreciate it. 1) Respect the uncertainty. Understand no one has all the answers. 2) Just go for it. Embrace being uncertain as a way to stay open to new growth.